My Little Pony: Friendship is Magic Season 7 will start airing in mid-April! So I thought I’d do separate nail art for each of the mane six since before (here and here) I’ve done group nails. I decided to start with Applejack. This was time-consuming yet simple. 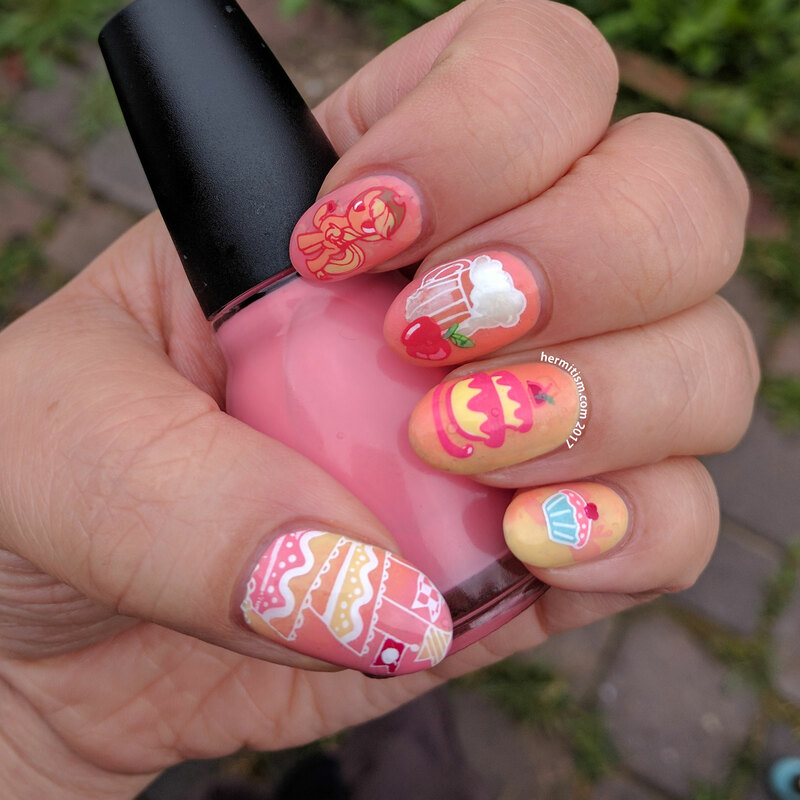 I sponged a vertical gradient across my nails and threw nail decals I made on top, sometimes modifying the images to add apples. I think I made too many decals and this would have looked nicer with a few plainer nails. I’m also sad because I have zero stamping plates with obvious pie pieces. 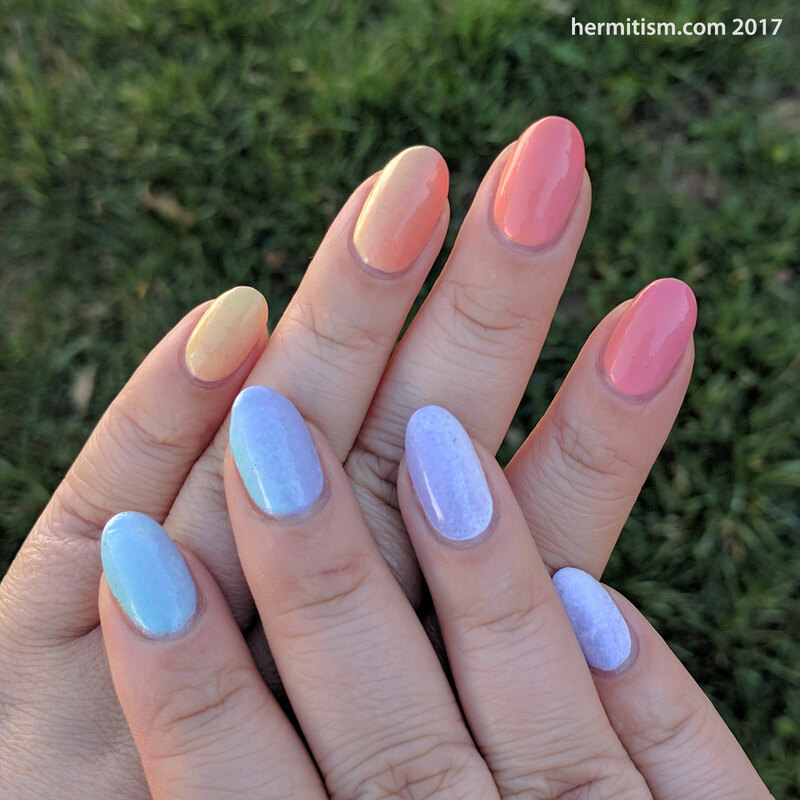 No apple pie for this mani. 🙁 Things were bought after this. I love pie a lot more than I love cake. The gap must be filled! Also, trying to match Applejack’s main body color sucked. I have not a lot of orange polishes so I ended up mixing up a yellow and orange to get the color I wanted. I love It! Love the “cider” image with the apple- perfect for Apple Jack! And she definitely makes apple flavored cakes and cupcakes sometimes, so even though you couldn’t find a pie, it still works. I was going to suggest the Bundle Monster holiday collection on the round plates for some cute apple pies- I noticed they have that whole collection on sale for 0.59 each right now, but I already own it. But it seems like you already filled that hole in your collection! Actually, I ended up buying a knockoff of that exact nail plate you mentioned (the knockoff’s image is bigger). And today a nail plate arrived that also had pie. O.O If only I started with a different pony! I’m glad you loved it (esp the cider!). Are you a pony fan too? I used to be more into it than I am now- I do still enjoy watching the episodes on Netflix with my kids. I used to enjoy watching YouTubers break down the episodes in full literary analysis and everything- it’s kind of fascinating the fan world that has been created around the series.